If you have any questions about Wahl and Moser dog clippers, blade and comb attachment compatibility and sizing or spare parts and servicing options please get in touch. We’ve built up a reputation is the UK’s dog clipper experts and we’re always happy to offer advice and help. It’s been around a while but, has always been favoured for its light weight handling and high powered motor. It’s another clipper ideally suited for training purposes but, offers excellent value for money. 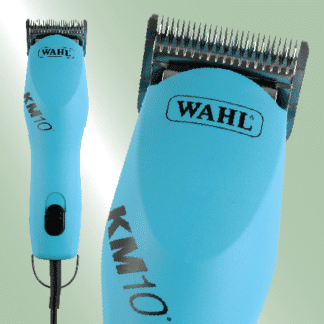 Part of Wahl’s latest generation of professional dog clippers, the Wahl KM10 harnesses ‘brushless’ motor technology for maximum durability and performance. Part of Wahl’s latest generation of professional dog clippers, the Wahl KM5 is a good all-rounder for general grooming and coat styling.